You would think that serving Campos, Bangbang couldn’t put a foot wrong. Our table was divided though. Two of us enjoyed our flat whites while two others thought they were too acidic and watery. 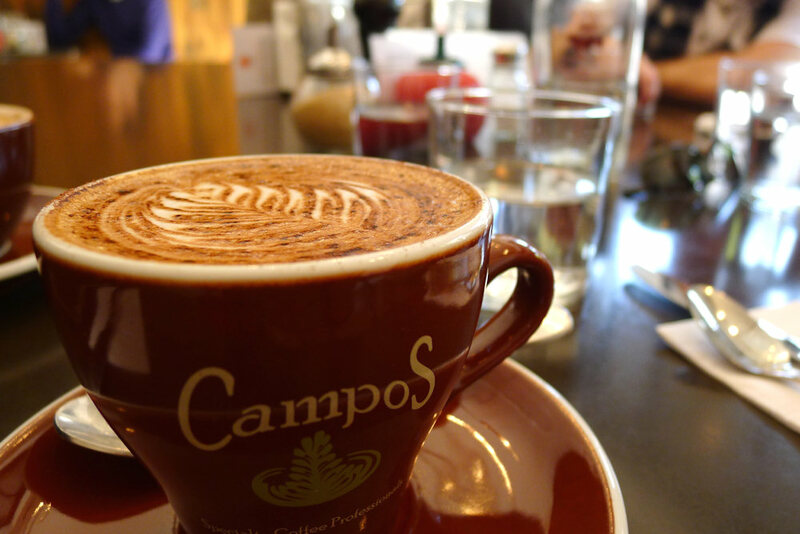 If you’ve been there, let us know what you think of the coffee. 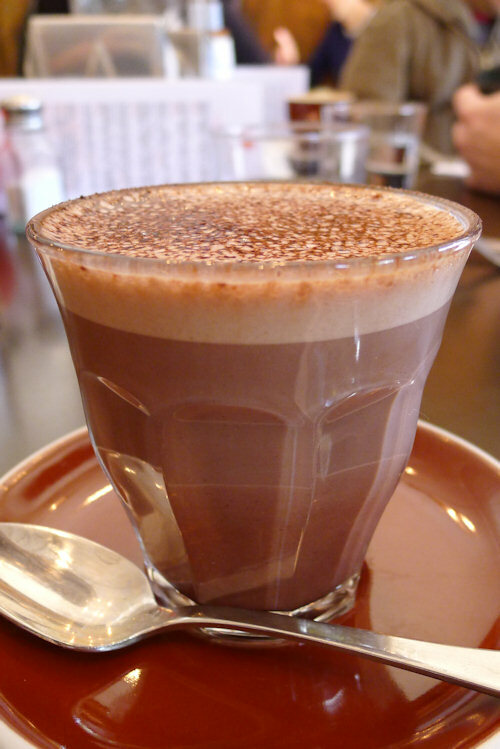 The news on the hot chocolate ($4.40) front wasn’t looking much better as it was too watered down. Kali Premium is used which is gluten and dairy free but we prefer our chocolaty drinks rich and indulgent. The food is where Bangbang started to shine. We didn’t have to wait long for our meals at all and the parade of fantastic-looking dishes started with the Bangbang breakfast stack ($16.90). Squeals of delight could be heard from our guests as they discovered that the poached eggs had been prepared exactly how they liked them: runny yolks with firm whites. 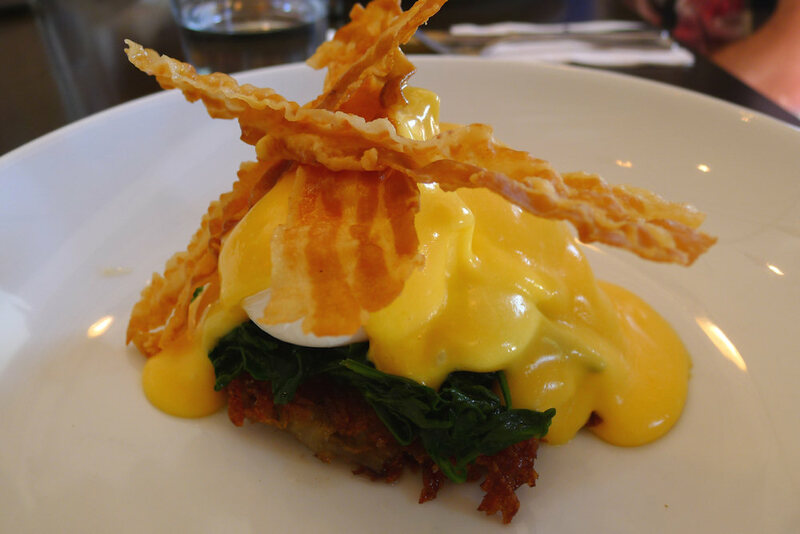 The positive comments continued as they discovered the flavoursome spinach and potato rosti below. The hollandaise sauce was hard to fault and the crispy pancetta on top is something different that added great texture and flavour. Only positive comments, again, for the English breakfast ($19.50). 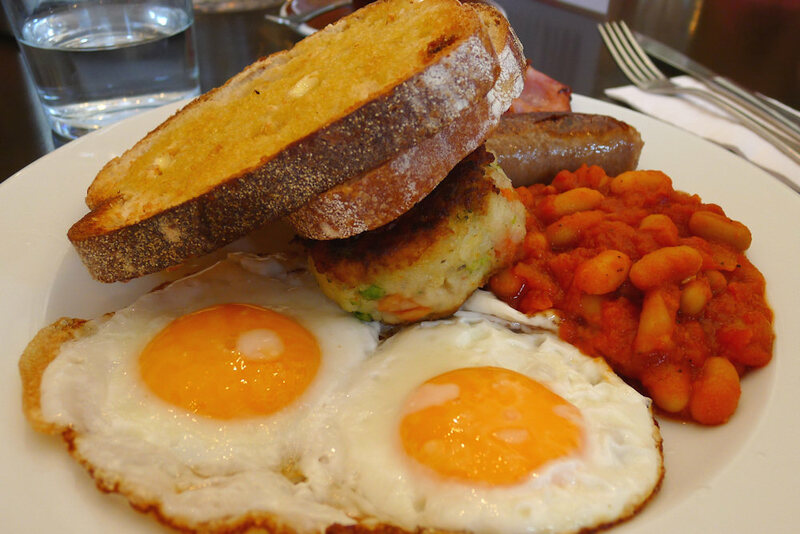 Free range pork sausage, bacon, two fried eggs, Bangbang baked beans, bubble and squeak, roast tomato and sourdough toast make this a ‘big breakfast’ eater’s delight. Everything had been prepared well and, despite the size of the dish, presented well too. 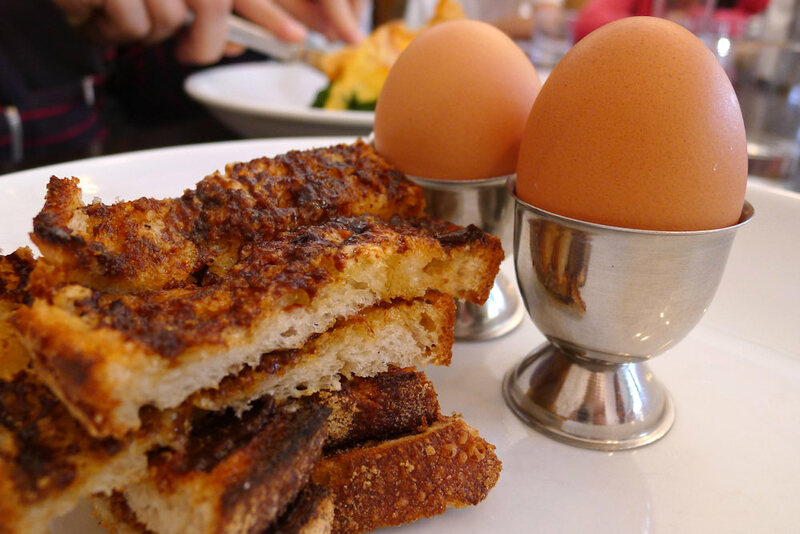 The 2 soft boiled eggs with toasted Vegemite sourdough soldiers ($9.90) was hard to fault as the eggs were soft boiled and the bread was thick and tasty. However there wasn’t enough bread to last 2 eggs so we ordered another side. Welsh rarebit ($14.50)… something very rarely seen on menus but absolutely perfect for winter days and treasured by those who know the dish. This unfortunately was not a well executed rendition. The sourdough toast provided a fantastic base but it was all down-hill from there. The thick layer of mustard, (blackened) cheddar cheese and Worcestershire sauce on the side made for a very salty and overpowering combination. Having tasted this dish prepared well before, we were left hunting the menu for a sweet fruit salad but left wanting. Our suggestion (if we may be so bold) is to lighten up on the mustard, layer on more cheese and definitely do not charcoal most of the top of the dish. Update: see Bangbang’s reply below in the comments section. Our hunt for the best breakfast and coffee in Sydney continues but there are definitely some positives to Bangbang. The extensive menu has something to please most tastes and the majority of it is prepared very well. The hollandaise sauce and beans were some of the honourable mentions. We were divided on our drinks and meals this week. Some were exceptional and others disappointing. 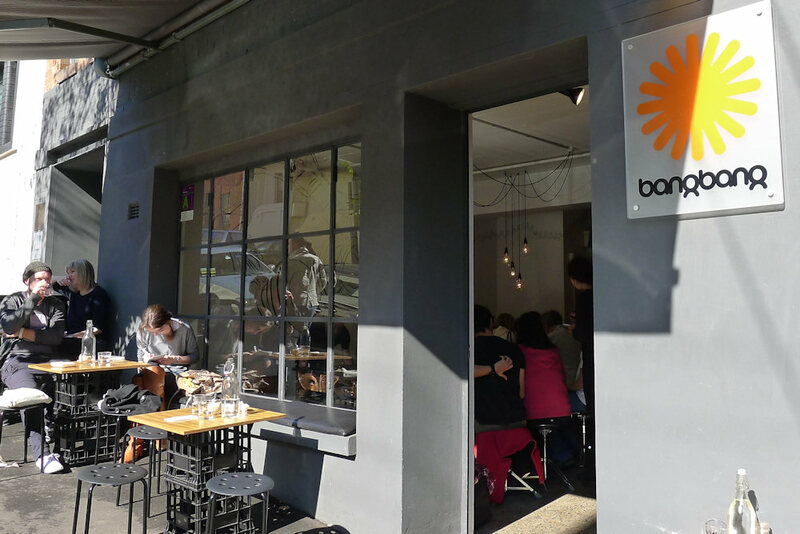 We’re interested to know if any Sydney on Sunday readers have been to Bangbang and what you thought. 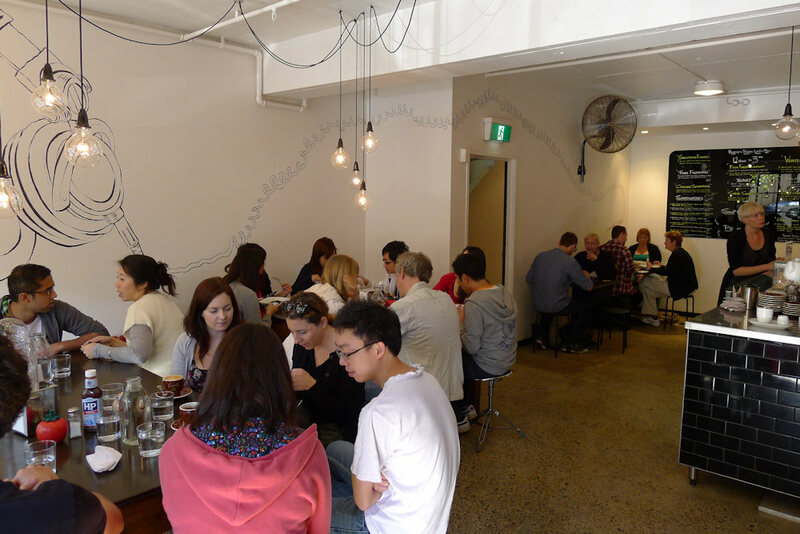 This entry was posted in Sydney - Inner East and tagged Dog friendly, Free range eggs, Outdoor seating, Parking close by. Bookmark the permalink. Hi there, thanks for the review of Bangbang. 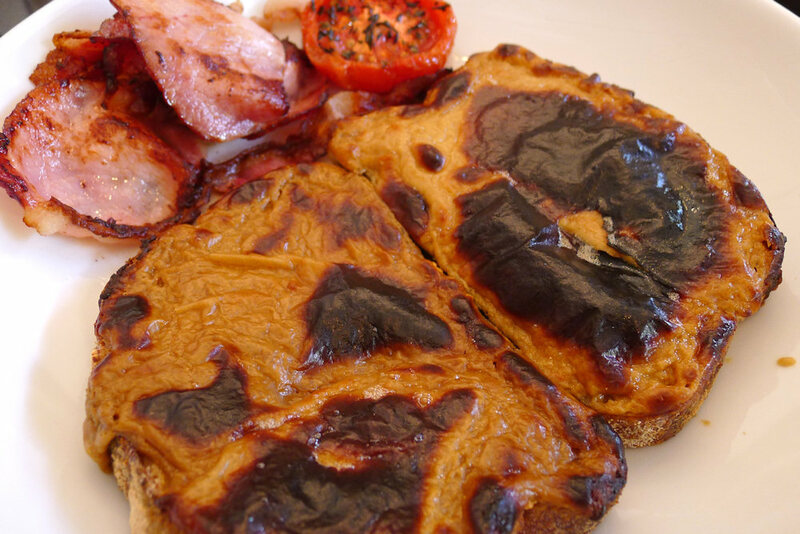 Just to let you know that the Welsh Rarebit we prepare is actually a classic Welsh recipe and is made to it’s traditional roots as it is in Wales, it is supposed to be served with the topping char grilled as shown in the photo above. To be honest the char and saltiness were the dominating flavours. We’re more than happy for others to voice their opinions of the dish by commenting below but for our palette it did not work as well as other renditions we have tasted (despite, as you say, yours being prepared the traditional way). Thank you for an otherwise great breakfast. Bangbang is on our personal ‘return’ list! We totally appreciate your honesty and understand that not all dishes might meet all palettes but happy to know that you enjoyed otherwise. 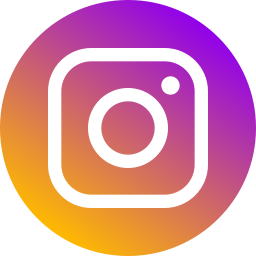 We look forward to seeing again at Bangbang, oh and we enjoyed reading your blog, when we get a weekend off we are going to try some of your suggestions…. Welsh Rarebit = Bar Mattino. Might not be as ‘traditional’, but tastes a whole lot better! you guys @bugglesandsqueak must have some interest in Bar Mattino as no matter what the dish is in various blogs and reviews you ALWAYS say its better at BM! very suspicious indeed…. You never have anything to say other than comparing BM, and to be honest its not that great! The overpowering flavour is English mustard, its FAR too wet and asparagus does not feature any any Welsh Rarebit recipe I have ever seen….. Let other shave their opinion, why do you always all over the net have to reply in this manner…..